If you're just getting started, I think there's no need to be snobby about Pro-Tec or Triple Eight protective gear. I skated in two sets of Pro-Tec Street wrist guards & elbow and knee pads through two years of Derby Lite and through my first WCR home season, though most of that was on the Rioters and on the Fury bench. 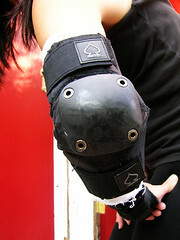 These, actually, are the lighter Pro-Tec Park elbow pads, which I traded from shoalmate Zombea for my 187 Killer Elbows. Because I thought, I'm just skating Derby Lite and I never fall on my elbows and the 187s are a little much & then not two months later, I'm trying out for the Windy City Rollers. Who knew. 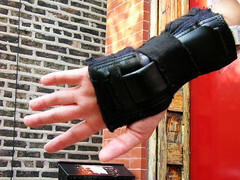 I still don't fall on my elbows; but I don't love these elbow pads anyway, because they slip a lot. So I'm still looking for an elbow pad to love. But in the meantime I will tell you that wearing cut-off cotton socks as arm gaskets absorbs sweat, which keeps your elbow pads from a) smelling and b) falling apart, and c) the worst thing ever, sticking your arm into an elbow pad that's still wet inside from practice two nights ago. I guess that's the plus of the Pro-Tec elbow pads, they're open on the inside; they're cooler to wear, and they dry quicker between practices. People did think I was a little crazy for sticking to Pro-Tec Street knee pads through my first home season, but I doubled them up with Gladiator knee gaskets and was mostly fine like that. Mostly. 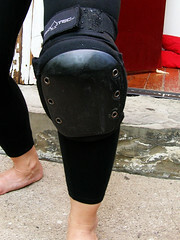 These are slip-on knee pads as opposed to wraparound, so they do get stretched out with wear. A stretched out knee pad can slip at the wrong time. Meaning when you fall on your knee, which you fall on more than anything else. That hurts, and sometimes it punches out a perfect penny-sized hole of skin off your knee cap. I really liked my Pro-Tec knee pads, despite losing that little hole of skin; but I guess I would only recommend them for recreational derby or for just getting started. And also, knee pads and gaskets smell and fall apart less if you wear them over some kind of fabric like leggings.